How you usher a question into existence on Quora can make or break the success of that potential lifelong resource. At this point in Quora’s development, it’s still critical to make sure a question is asked at just the right time, assigned enough relevant topics and directed to the right people to answer it. These steps are absolutely necessary to ensure that question gets the best possible exposure (and thus answers) it could ever hope to receive. I recently saw the biggest example of this in my own use last week when I asked the question: Why is it seemingly more difficult to remember things from before 3-5 years of age? It also got a few really good answers, probably the best you could get short of walking up to a university researcher studying the topic and unabashedly asking them. I know this because I made my friend ask their UCLA neuroscience professor the same question at office hours and didn’t receive anything conflicting or all too different from the Quora page. But what was it about this particular question that made it succeed? It turns out that the whole scenario was an accidental experiment of sorts. Unbeknownst to me, there was a similar question already around entitled: Why can’t most people remember things from their infancy? So, what does the data reveal? In short, it absolutely confirms the advice mentioned in Marc Bodnick’s answer to Quora User FAQs: What can I do to aggressively market my Quora question? What can I do to bring an old question back to life? ask the right people to answer; if you find that perfect person to answer a question, they’ll make it a standout page and it’ll attract even more traffic (not to mention providing a useful answer to begin with). Seek active users with relevant expertise; the new Ask-to-Answer improvements make this a lot easier. In the case of this question, I took the time to ask active psychologists and neuroscientists on the site who had already answered several questions in their fields. Bonus points for asking users that are followed by influential Quora Elite. cross paths with influential users; if you see some influential users on the site (lots of followers, lots of mentions, etc) voting or following in areas relevant to your question, somehow indirectly grab their attention. the mere act of them following or voting on your question page will create a huge cascade of traffic. #3 is especially complicated, but there’s definitely a formula to it. For example, to “cross paths” with an influential user, consider the following scenario. 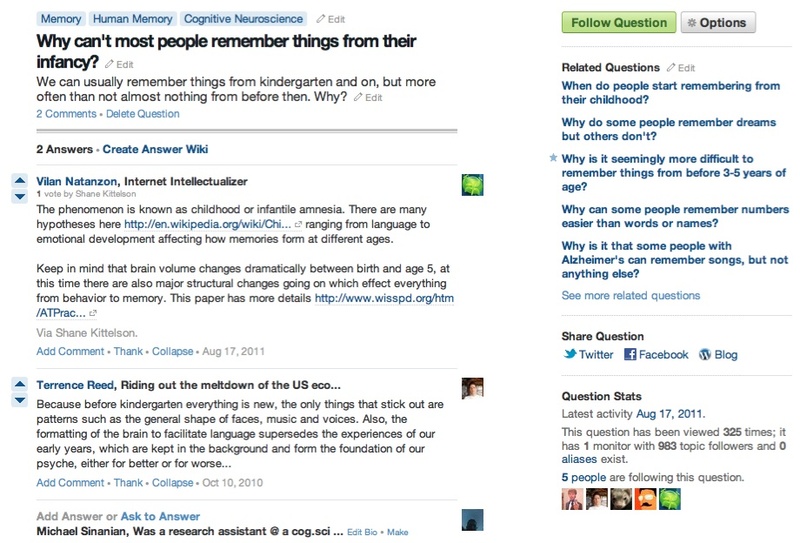 In the case of this Human Memory question, I’ll hold off on asking till I see someone who works at Quora (they all have lots of followers) start voting and/or following questions in that topic or related topics (like Psychology, Neuroscience, etc), then I’ll pose my question at that moment. Odds are, they’ll see it, and since their interest is already currently piqued, they’ll be more inclined to follow or ask others to answer it. Yes, I really do take those extra steps. I don’t care if you need to jot down questions in a note file and save them for a month or two: timing is everything. I did this for the question at hand and it worked wonders. I’ve simply had too many questions miss their crucial opportunity window, going unseen and unanswered because of such shortsightedness. Will the Quora team eventually figure out a way where timing and all these other hacks are no longer necessary for a fluid question-answer marketplace? Hopefully, but until then use the results of these experiments so your questions get the limelight they deserve. *This is cross-posted from a personal Quora post. You are currently browsing entries tagged with neuroscience at The Quora Review.